After the 1935/36 tent camp, plans for buildings to accommodate a complete infantry brigade were prepared by the Quartermaster General’s Office and the Works Branch of the Australian Army. However, building activity was slow. When World War II broke out in September 1939, Northam Army Camp suddenly became the focus of frantic building activity. 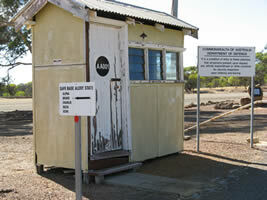 Northam Army Camp Sentry Box, 2010. Courtesy of NACHA. By early October, 175 huts had been built. Some of the larger buildings, like the mess huts, were relocated from the World War I training camp at Blackboy Hill. Other buildings were constructed from materials recycled from Blackboy Hill. Most of the buildings were timber framed clad with corrugated iron. The barrack buildings, each accommodating 48 men, were grouped together to form a company. Each company was serviced by a headquarters, a quartermaster’s store, cook house, mess hut and ablution block. Officers and senior NCOs had separate accommodation and mess. The whole camp was served by general camp facilities, canteens, the YMCA, Salvation Army and Red Cross posts and Camp Hospital. Located in the centre of the camp, the Hospital initially comprised a main building with two wards of 16 beds each, a treatment room, offices for the commanding officer and matron and kitchen facilities. Two detached buildings accommodated the quartermaster’s store and nurses’ quarters. Staff comprised the Commanding Officer (doctor), a matron, three nursing sisters, two male nursing orderlies, four general duty male orderlies, a quartermaster and cook. As the war progressed, staffing the Army Medical Units became a problem and Voluntary Aid Detachments (VAD) were called on to replace male orderlies volunteering for active service. The first VAD to serve at Northam was a member of the Boulder Voluntary Aid Detachment 523, who arrived in 1942. However, the supply of VADs eventually dwindled and a new service was established – the Australian Army Medical Women’s Service (AAMWS). VAD members were absorbed into the new service and new recruits completed standard army training and specialist trade courses. Minor surgery and general medical cases were treated at the 38th Australian Camp Hospital. Serious cases were transferred to the 118th Australian General Hospital at Northam. Members of the Australian Army Medical Corps training in the camp spent time in the hospital to get hands on experience. In 1943 a hut was built behind the hospital so staff had their own mess and recreation hall. The 38th Australian Camp Hospital was disbanded in January 1944. The buildings were handed over to the Armoured Division and staff were transferred to other medical units. Most staff from Northam then served at the 110th Australian General Hospital at Hollywood in Perth. The grid pattern layout of Northam Army Camp was typical of military training camps throughout Australia. Below is a stylised, approximate representation of Northam Army Camp in 1939. Map Guide: [A] HQ & Mess Hall, [B] Storage Areas, [C] Parade Ground, [D] Cool Rooms, [E] Petrol & Lubricant Compound, [F] Workshop & Store, [G] Hospital & Nurses Quarters, [H] Block D (Kitchens), [I] Block E (General Accommodation), [J] Block F (General Accommodation), [K] Block G (General Accommodation), [L] General Accommodation. Phil Loffman explains how he joined the cadets at 14 (saying he was 16) and helped expand the camp with the aid of horses. Ray Middleton describes the conditions within the Army Camp's accommodation in the 1940s and how it prepared them for WWII.